Pete Canter’s composing projects include writing for his own jazz combos, for larger ensembles which include jazz and classical instruments and for contemporary music ensembles. Pete has composed new tunes and re-arranged existing originals for a group including sax, flute, strings and rhythm section. Originally a jazz trio plus cello, this band has been expanded first with drums and more recently with flute and/or violin. The music is European style contemporary jazz with elements of latin jazz, folk and classical music. The music was first performed in the Exeter Vibraphonic Festival in March 2016 at Exeter Phoenix. 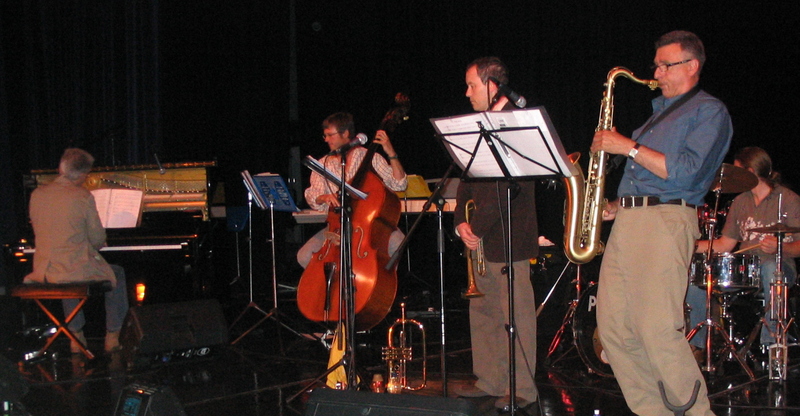 A recording session with a quintet version of the band produced the excellent album Strange Bird. 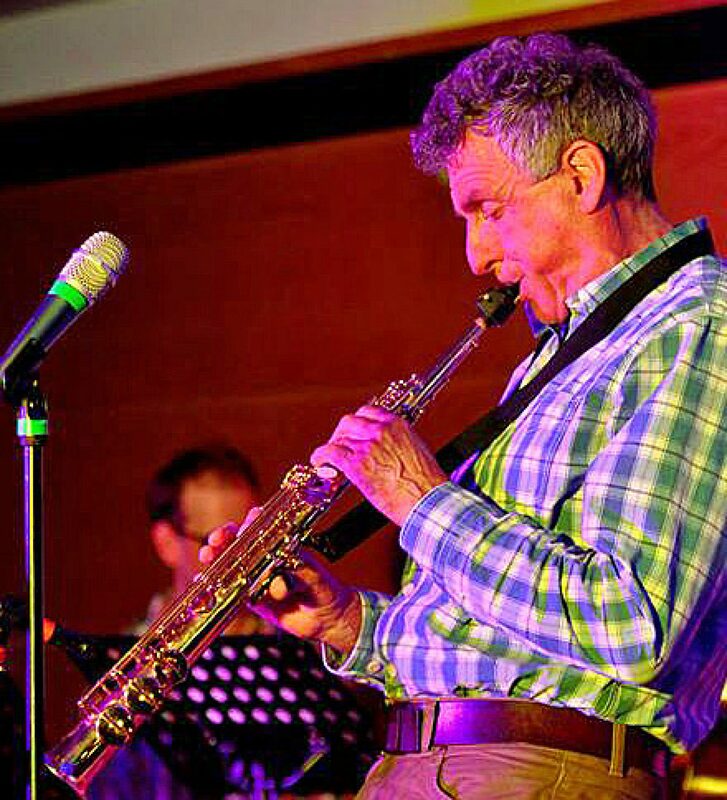 Pete Canter’s Sky Ensemble performed at Teignmouth Jazz Festival in November 2016 (quintet), Exeter Vibraphonic Festival on Wed 15th March 2017 (sextet) and at several other venues since as a septet or sextet. Also performed for the first time at the Exeter Vibraphonic Festival 2016, Tubes is a contemporary music duet for alto flute and bass clarinet. 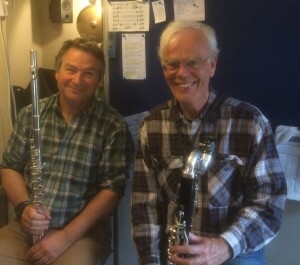 Tubes was composed by Pete for classical musicians Robert Stephenson (flute) and John Welton (bass clarinet). This recording of Robert and John perfoming Tubes was captured by Pete in his home studio on 18th March 2016. Pete playing Koivu ja Kataja at Teppo Fest May 2016. Photo courtesy of Katrien Bos. A short solo piece for double bass performed by Pete at Teppo Festival 2016 celebrating the 75th birthday of Finnish double bassist and composer Teppo Hauta-aha. Koivu ja Kataja (The Birch and the Juniper) interleaves sections of punchy pizzicato with flowing bowed sections representing the two aspects of Teppo’s musical life in jazz and classical music. 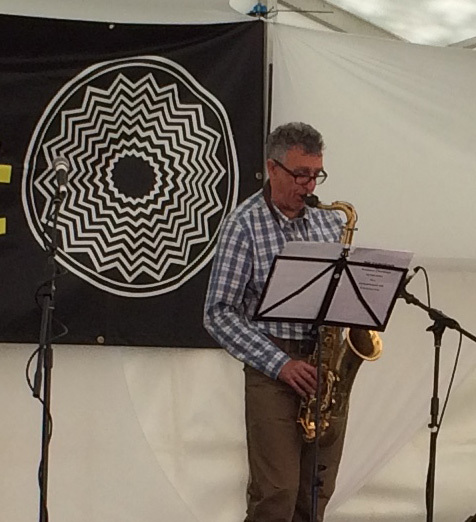 “The Gathering” is a 25 minute piece for solo saxophone and soundscape performed by Pete at Exeter Respect Festival on 7th June 2015. The soundscape combines elements of pre-recorded instrumental sounds (double bass, electric bass, guitar, keys, drums, congas all played by Pete), electronic sounds and found sounds. The music is atmospheric, blues influenced and generally chilled out but interrupted by episodes of Pete’s contemporary music writing. The Gathering refers to the gathering of people at the festival, which is a celebration of diversity in Exeter, and a gathering together of Pete’s diverse instrumental and composition skills, styles and techniques. Clock Works is a suite of four movements each lasting exactly 10 minutes, for 10-piece improvising ensemble Off the Cuff. The process of musical events in the piece is controlled by a clock and while certain harmonies and rhythmic events are specified in the score, the musicians are given wide latitude in their interpretation and lots of space for improvisation. Clock Works was performed by Off the Cuff in the Exeter Vibraphonic Festival on Friday 20th March 2015 at Exeter Phoenix. Scored for a small contemporary ensemble of flute, bass clarinet, percussion, violin and cello, the title is taken from something said by a particle physicist during a discussion of neutrinos in an episode of Melvyn Bragg’s In Our Time on Radio 4. The musical material was originally generated as a series of isorhythms for the flute, violin, cello and temple blocks which collide, combine, duplicate and decay. These are set against, interact with and at times overwhelm the bass clarinet melody. The piece is periodically broken by moments of peace in the form of sustained chords. This version is generated in Sibelius software. If We Could See Through Neutrino Eyes was played by Kokoro, contemporary music ensemble of the Bournemouth Symphony Orchestra at a workshop led by James MacMillan and Mark Forkgen on 2nd March 2013 at The Lighthouse, Poole as part of the B.S.O.’s South West Composers Day. Scored for flute, bass clarinet, soprano saxophone, flugelhorn, cello and double bass, Garzonic is inspired by the chromatic, triadic approach to jazz improvisation of legendary U.S. saxophonist George Garzone. A challenging contemporary music duet for two of Pete’s favourite instruments. Music for soprano saxophone and amplified double bass. A 10-12 minute piece with a strong jazz influence, incorporating implied harmony (hence the title), sections of constrained and free improvisation and written passages which contrast haunting minor melodic lines with frantic repeating and interlocking triplet figures. 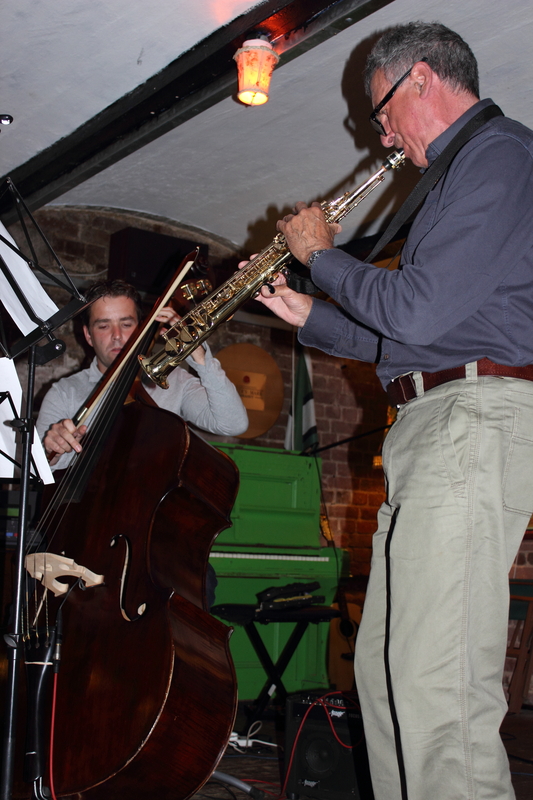 The Invisible Man was given it’s debut performance at a Non-Classical event at The Bike Shed Theatre, Exeter on 30th June 2013 with Pete Canter on soprano sax and Jim Rintoul on double bass. 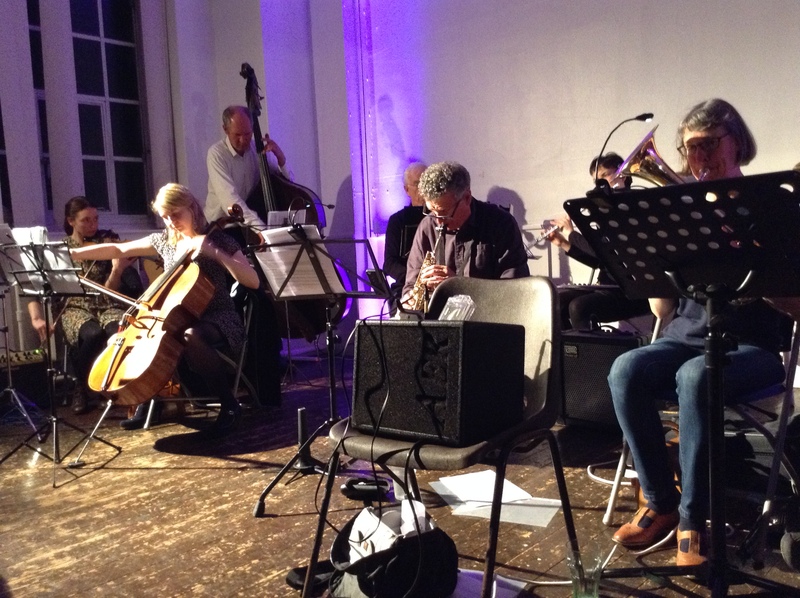 Commissioned for the Exeter Vibraphonic Festival, Sketches is a suite scored for the OCTOBER ENSEMBLE, a 10-piece band made up of jazz quartet, strings and horns. 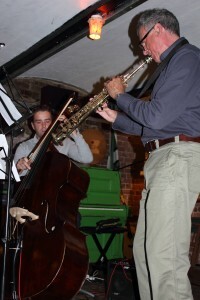 The music is a blend of contemporary jazz themes, minimalist soundscapes, latin and downbeat grooves and improvisation. Sketches was premiered on 13th March 2010 at Exeter Phoenix. The event was supported by Exeter Arts Council, Exeter Phoenix and private sponsors, St David’s Equine Veterinary Surgeons and Glanville Robinson Solicitors. Sketches was also performed at Tiverton High School in June 2010 by a quindectet: 6 violins, 2 cellos, 2 flugelhorns, french horn, piano, bass, drums and saxophone. Pete Canter’s October Ensemble. The quindectet pre-perfomance at Tiverton High School June 2010: Ian Wright (piano), Marcus Russell (bass), Steve Crossen (drums & percussion) Kate Turnbull, Sophie Holden, Anna Davis, Ellen Stratton, Philip Belsham, Carmen Denman (violins), Carol Galton, Isabelle Woollcott (cellos), Mike Brewer, Gill Baker (flugelhorns), Nicola Cleave (french horn), Pete Canter (saxes). 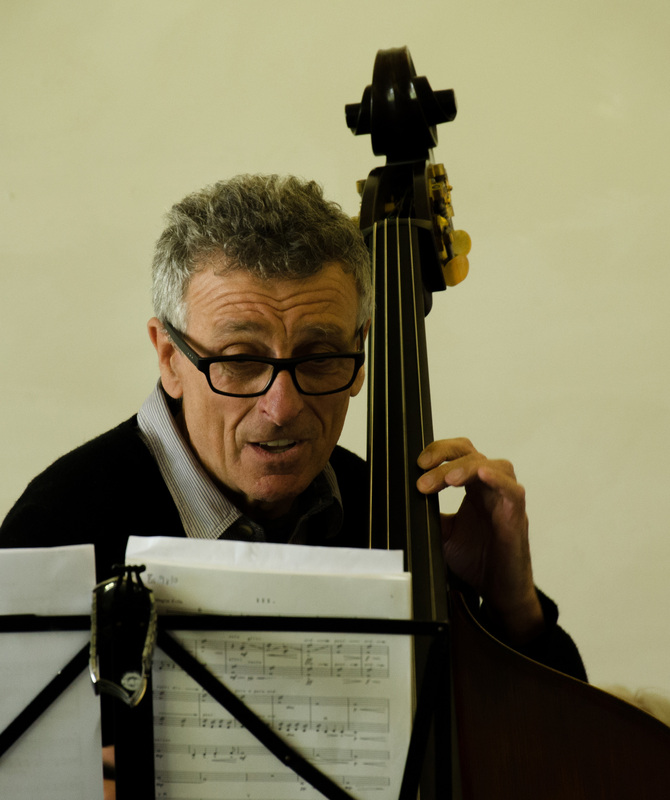 Pete Canter began composing tunes for small jazz combos a number of years ago and included Down from the Trees, Slick and Why Not on the 2005 Pete Canter Quartet album and again on his 2007 compilation album So Far. In 2005, he was awarded a mentoring grant by Artsmatrix to study jazz composition with internationally renowned saxophonist/composer Iain Ballamy and worked with him for a nine month period between 2005 and 2006. He went on to write a collection of tunes scored for a quintet with sax and trumpet frontline. This band, Pete Canter’s October Quintet gave a debut performance of the music in the 2007 Exeter Summer Festival supporting the Kyle Eastwood Band at Sy George’s Hall Exeter and received a great reception. The October Quintet went on to perform at the Taachi-Morris Arts Centre in Taunton and at sell-out concerts at the Bridge Inn, Topsham and at the George Hotel, South Molton. The band also went down a storm in the 2008 North Devon Festival performing at Zena’s in Barnstaple. These compositions draw on influences from the hard-bop, be-bop and latin jazz tradition, the musical styles of Horace Silver, Bill Evans and Kenny Wheeler, experimental and contemporary classical music approaches and free jazz. Outside In was a suite of compositions scored for the October Quintet. 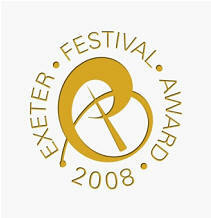 It was performed in the 2008 Exeter Autumn Festival with the support of a grant by Exeter City Council. 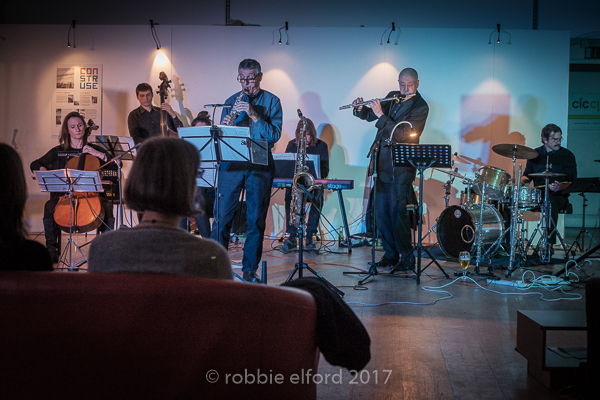 The event was staged at the Amber Rooms in Exeter to a packed house including many young people who do not usually listen to contemporary jazz. Also in 2008 Pete was featured in a PRS-MCPS monthly podcast of new composers.